Come and see this impeccably manicured 3 Bed + DEN, 2 bath CARDEL home. A SPLIT FLOOR PLAN with plenty of privacy, not only does this home reflect pride of ownership, but it also exudes LUXURY. Immediately upon entering the home, take in the rich detail of the pillars, tray ceilings, wood-like plank porcelain tile, & the water view seen straight through the great room out the sliding glass doors. The 14' ceilings, open floor plan, and skylights give the home an extra feel of openness and lightness all around. Master suite is a private retreat with a garden tub w/separate shower, separate vanities, 2 walk-in closets, and a sitting area with sliding glass door directly to your lanai. FULLY LOADED UPGRADE LIST includes: GOURMET KITCHEN w/ 42" solid wood cabinets w/crown detail, mirror-finish oversized granite island, eating space in the kitchen, plantation shutters, tons of windows, granite countertops throughout, travertine entry, 14" ceilings, tray ceilings throughout, glass french doors, laminate flooring, porcelain wood-like plank tile, no carpets anywhere, formal dining room, open floor plan, and an over-sized garage with plenty of storage space. Community features 2 dog parks, splash park, playground, tons of community activities put on by the social committee, & more. 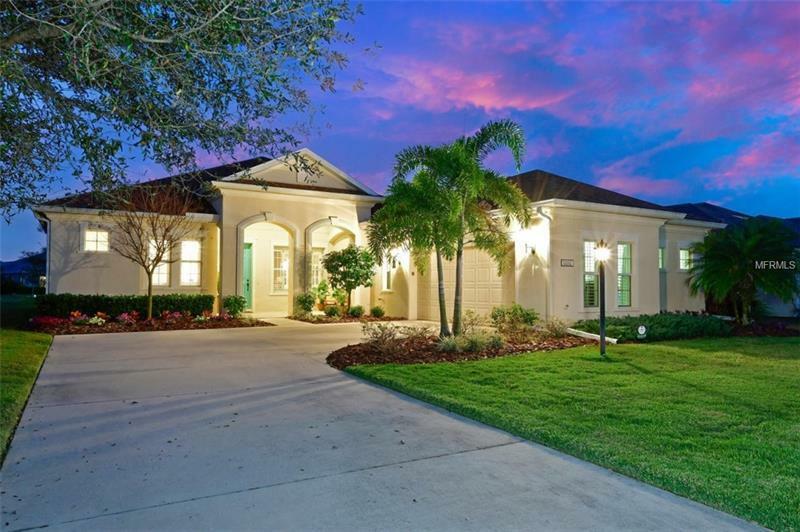 Centrally located & within minutes to the local A+ schools, shopping, restaurants, bars, downtown Lakewood Ranch, gyms, airport & local beaches. This home has it all!